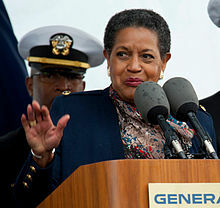 Myrlie Evers-Williams (born March 17, 1933) is an African-American civil rights activist and journalist. She worked for over three decades to seek justice for the 1963 murder of her husband, Medgar Evers, a leader in the African-American Civil Rights Movement. She was also chairwoman of the National Association for the Advancement of Colored People (NAACP). This page was last changed on 13 February 2017, at 20:42.